I was looking for a way to extract “Nouns” from a set of strings in Java and I found, using Google, the amazing stanford NLP (Natural Language Processing) Group POS. To do this, the tagger has to load a “trained” file that contains the necessary information for the tagger to tag the string. This “trained” file is called a model and has the extension “.tagger”. There are several trained models provided by Stanford NLP group for different languages. 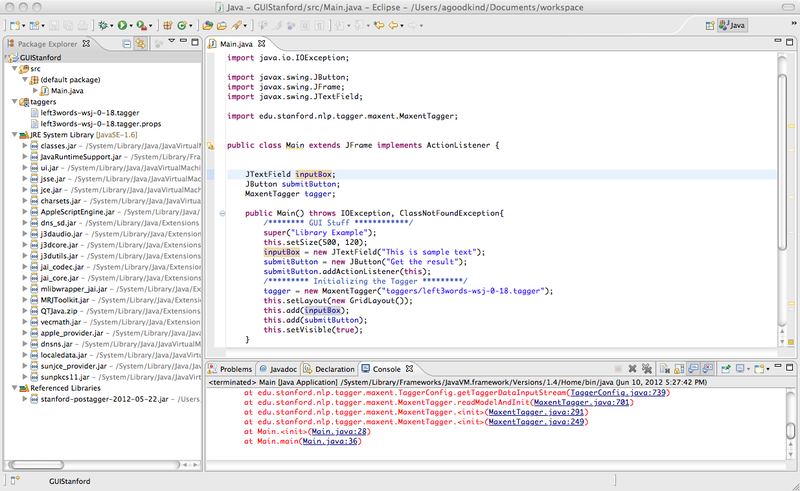 In this post I will show you how to use such library in your Java application using Eclipse IDE. Create a new folder called “taggers”. Download the zip file provided by stanford group. Extract the zip file and Open the extracted folder. You will find a folder called models, open it and copy the model you want to the “taggers” folder we created earlier + its corresponding (with the same name) “.props” file. Now we need to import the library to our project so that Eclipse does not complain when we use it in our code. So, right click your project > Build Path > Configure Build Path. In the new window, Open the libraries tab (from the top) and click the Add External Jars button. Locate the “stanford-postagger.jar” file that is found in the extracted folder. Once you write the code, Eclipse will tell you to import the MaxentTagger and inform you that it throws some exceptions. Use eclipse to add all that to the code. This will output the same result that’s mentioned at the begining of the post. What does “NN” or “DT” mean? The tagger uses the Penn Treebank tag set for English language as stated on the library’s homepage. For a list of the abbreviations click here. See the included README-Models.txt in the models directory for more information about the tagsets for the other languages. It turns out that the problem is that eclipse allocates on 256MB of memory by default. RightClick on the Project->Run as->Run Configurations->Go to the arguments tab-> under VM arguments type -Xmx2048m This will set the allocated memory to 2GB and all the tagger files should run now. Click here to download a sample project (for usage with Eclipse). It contains a tagger and a GUI example. i am passing “models/left3words-distsim-wsj-0-18.tagger” as the file is under models folder. should this folder be in the same working space as of my project? yeah the folder should be inside your project’s folder. To do this from Eclipse, Right click the project’s name and choose to create a new folder. Thank you for sharing the knowledge, Galal. Really helped a lot. Use 7-zip wheneven unpacking .tar files, i had problems using winrar. thanks a lot for this post…. I didn’t try training a model =D u can check their mailing list or something. It worked perfectly … I would like to know how to extract verbs and nouns alone from the tagged text ??? Yes, I have the same question, is it possible? Thanks! Very useful and concise! thanks for the tutorial. Do you have another tutorial for using lemmatizer in stanford core NLP? Actually i did not use it but i guess it’s pretty much the same. Download the library, add it to the Eclipse external libraries and start using it. Hey thank you very much. This neat little tutorial saved me allot of time!! hey.. m getting this following error.. pls help asap. Error: No such trained tagger config file found. Are u sure u created the taggers folder in the right position and copied the tagger file to it? hey i got an error while using this code. Can you please guide me what should I do ? Can you please possibly say where is it going wrong? By the way, FYI, I use a Macbook…MAC OS X 10.4.11! Actually I didn’t get that error while working on my project so I do not know the answer. Try contacting them on the mailing list. If we have to make our own tagger file then what we should do? ?Can u guide?? And also IO exception is shown. Here is an archive. Import it using Eclipse. It contains a frame with an input box and a button. When you click the button the text in the inputbox is tagged and re-displayed. Repeat step 6 in this post if necessary. Thanks for the tutorial, really helped me get started. Just wondering, does the POS Tagger help with identifying phrases (not just words alone)? Thanks for your nice presentation. Could you please let me know how can I use POS tagger using NetBeans? It will be very helpful for me. Waiting for your reply. I will try to post a tutorial soon isA. I have the same interest as Shuvo on how to use POS with NetBeans. We have this project to convert english sentences to first order logic form. Your code to tag text in POS helped us. Can you please help us with the java code to convert these tagged sentences into FOL(First order logic form). A little guidance would matter a lot. I got the same err, but i dnt know how to solve it. Can you please provide me with your folder structure? This tutorial is great! Thanks for taking the time to put it together Unfortunately, I’m receiving the same error as the people above. Here is a link to a screenshot of my folder structure. I used your example, but it doesn’t seem to be working. It also required refreshing the project after setting up the libraries. Any ideas about how to make it work with the latest release of the POS tagger? we have made the above change and it still shows d same prob! What could be the possible reason? Hey I got the output.. I had the same problem with almost all the tagger types. It turns out that the problem is that eclipse allocates on 256MB of memory by default. RightClick on the Project->Run as->Run Configurations->Go to the arguments tab-> under VM arguments type -Xmx2048m This will set the allocated memory to 2GB and all the tagger files should run now. I have a question about using the POS Tagger. I’m doing my PhD research and I need to extract N+N combinations from the texts. I’ve got a general idea about how to use a program but what I need to know is how many nouns you have in the dictinary of a program? I need my project data to be as accurate as possible.. Shall it be able to find 99% of them in the text? Hey thank you very much for the tutorial. It got my project started very fast. Thanks Galal! You really helped me a lot! Hi, can you make a tutorial for JCreator.Hope the tutorial will release as soon as posible. Thanks. I get it once i run the project. Thank you for the post. It helped me. Consider some nouns like “Royal Bank of Scotland” or “Bank of America”. How can we tackle this and make “Royal Bank of Scotland” as one entity.. In this case, “of” will consider as ‘IN’. i’m gettin this error. can u tell abt this error. Thank you Galal for this great tutorial. And I want to ask if I want build Arabic POS tagger , will be the Standford POS tagger useful ? I am confusing actually , because I want to implement HMM and try to get best result for word tag. If you can help me or guide me to do that I will appreciate that. what should I do and how can I deal with that ? Great job for putting this short tutorial up. When using your GUI example in eclipse, it complains about “MaxentTagger cannot be resolved to a type”. What should I do for it? Hello!, how i will use this tool using NETBEANS 7.0? Need help. Thanks. How to extract noun phase from the text file. I don’t know if this has been answered already but: Check the sample TaggerDemo2.java included in the zip. Also, if you want to understand the tagger more closely, they also included the source. Just see the jar with “src” appended to its filename. As far as I’ve read, you might need to use the class TaggedWord to access the tags separately. Follow the instructions under #4 for adding a model directly to the POS jar file. This solved all of my problems. Hi LSL,Thanks for sharing a denrefift system. Now we can take in some good new points and upgrade the worksheet.As mentioned by Reginna about Balance Check and How sure are you?, I’d like to share my pov that there is no point achieving our goals at the expense of our relationships, health, family or other people. We don’t live alone in this World, and I think it is a wisdom we work on every day to know how to satisfy our own needs and other people’s.When we understand our priorities and responsibilities, we can learn to dance with these variables and stakeholders, and rise up to the top of our goals, truly feeling proud of ourselves.I guess, ultimately, everyone is seeking for some form of balance in life. In fact, going after our goals could be one way we are seeking to balance our lives.So the question is: what priorities are we willing to adjust to achieve the goal. And why? I need a sample of data for training. When I m using conll file it says it needs “/” between words. Please send me a sample to know what should I prepare! in case you still need this. you can use the brown file to train a model. Hi, how do i incorporate the .props file when using eclipse? it seems like the tagger can run perfectly without the .props file. Thanks so much for this very helpful tutorial! A couple poitns. First, as the website poitns out: It is permissible to use previously constructed lexicons, word clusters or other resources provided that they are made available for other participants. So you can use clusters, but in the spirit of open competition, we ask that these resources be made available.Second, I agree that taking a domain, running system X on the domain, doing an error analysis and then adding features, changing the model or annotating some more data is a very good way to adapt systems. I don’t think anyone is scared’ of this approach. In fact, outside academia, this is the standard way of doing business, not the exception. However, this is not as easy as it sounds. First, you need the resources (human resources that is) to do this for every domain on the web or domain you might be interested in. Second, the annotations you wish to collect must be easily created by you or via a system like mechanical turk. It is one thing to annotate some short twitter posts with 12-15 part of speech tags and a whole other thing to annotate consumer reviews with syntactic structure. I have tried both. They are not comparable. Even the former cannot be done reliably by turkers, which means you will need grad students, staff research scientists or costly third party vendors to do this every time you want to study a new domain.So the spirit of the competition was to see, from a modeling/algorithm perspective, what are the best methods for training robust syntactic analyzers on the data currently available. By limiting the resources we are trying to make this as much an apples-to-apples comparison as we can. Even this is impossible. Some parsers require lexicons that might have been tuned for specific domains, etc.Understanding this is still valuable in the analyze, annotate and iterate approach. Don’t you want to start off with the best baseline to reduce the amount of human labor required? In reference to “model” parameter must be specified errors, look at http://nlp.stanford.edu/software/pos-tagger-faq.shtml (#9). Hey, How we can set output format ‘-outputFormat tsv’ in Java code? But this above link tells u how to install in Eclipse, here are the steps to make it work in Netbeans. 1. Create a new project. 2. Right click on ur project. Select new package. Name it as taggers. 3. Download the zip file provided by Stanford group (The link is given above in the steps). 4. Copy “left3words-wsj-0-18.tagger” tagger and props file from models folder of the downloaded zip file and paste it in taggers folder. 5. Now under project name, expand libraries and add new JAR/folder. 6. Select stanford-postagger.jar from zip files. This step configures the path for the JAR file. 7. Rest; implement the sample program given above. Just one correction. Instead of MaxentTagger tagger = new MaxentTagger(“taggers/left3words-distsim-wsj-0-18.tagger”); write MaxentTagger tagger = new MaxentTagger(“taggers/left3words-wsj-0-18.tagger”); The “distsim” has to be removed. HOPE THIS HELPS FOR NETBEANS USERS !! How to create the .props file? I am in dire need of open source code for implementation of natural language processing in java. Can anyone give me the link for this. actually stanford use java for their nlp research. so you may find many useful source there. I have the below error when i implement POS tagger in dynamic web project. I have models folder inside the project folder and the corresponding tagger file and property file. I’m new to java and stanford pos taggar. Im getting the following error when I run the my code. But I mentioned the model file in my code. anyone help me to solve the problem. Do you have any examples for using tagger in server mode? // we think it does, and that scanner works. I wanted to read a word from “input file” and check the word is present in “output file”. If the word present, write the string into “outputnew file”. In this code snippit BufferedWriter is writing into new file. I could not figure out the problem . Hi , I want to use the the model file in mapreduce for tagging the comments . How can I use this , Please let me know . Thanks for sharing the example. Your download link doesn’t work! Please update the link. Very nice tutorial. It was very informative and easy to follow. I am going to build a POS tagger for Sanskrit language. So, is it better to create a new one or to use one that exists for other language? Can anybody help me out with this please? Never mind. I fixed it alright Such a relief! Hi Tryphena, can you tell me how did you fix it. I tried upgrading my Java version from 7 to 8 on Ubuntu and changed the ‘Installed JRE’ in Eclipse too. But it didn’t work out. Let me know what you tried? I actually didn’t heed the steps in this post. All the while I kept trying having the Tagger folder in a different destination(Not the address which I used). Once I changed it it worked. Pingback: External JAR's and classpath for Servlets, help needed. get it done for FREE. I’ve got the mistake like that, can anyone help me? Can I get the POS tags as a separate array instead of appending them after the words?